See Press Releases related to Sports Psychology Coaching. Need An Expert On Sports Psychology, Peak Performance, Mental Toughness and The Mental Game? The media frequently use Bill Cole as an expert resource for quotes, a story, or for background information. Many organizations have recognized him as an authority in the psychology of peak performance, sports psychology, coaching, achievement, workplace productivity and stress management. Learn more about the book The Mental Game of Tennis, order a copy of the book online, or download the book cover in pdf format. Learn more about the book The Mental Game of Golf, order a copy of the book online, or download the book cover in pdf format. Bill Cole was recently interviewed by Kate Kilpatrick on the topic "Ego Out Of Bounds". Bill discussed problems of Tiger Woods and other top stars resulting from a culture of entitlement that's enabled by friends, family, coaches, teammates and the media. Watch a video of the interview (opens in a new window). Listen to Bill Cole being interviewed on 1460am radio as he discusses mental game topics including his books The Mental Game of Tennis and The Mental Game of Golf. The radio show reaches 3 million people on the 1460am dial in Philadelphia/Central NJ area. Bill understands your pressures, challenges and time constraints. He should. He's a former magazine correspondent, book author and editor and has published over 300 articles in his areas of expertise. He has conducted hundreds of interviews himself and knows how you work. He'll team with you to make your story come out right. 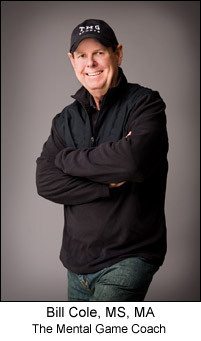 A number of organizations have recognized Bill as an expert in many arenas. "With 25 years of coaching experience, Bill Cole defines coaching as 'an action-oriented art where I collaborate with the client and together we advance specifically where they want to go.' Cole...believes that in order to be coached, 'the motivation has to come from the person. They have to really want it as opposed to my selling it to them. The client needs to find a coach who has specific expertise and a deep knowledge of the defined area so that there is a matching up of the client's need with the coach's experience. I call this 'the wisdom factor', because then the coach can navigate these waters astutely, since he's either been there or has worked with a lot of clients in that area. This approach is critical." Bill Cole MS, MA, as quoted in the article "How Coaches Give A Boost To Careers", by Evalee Harrison, Work Force Wellness columnist for The San Francisco Examiner and Chronicle.